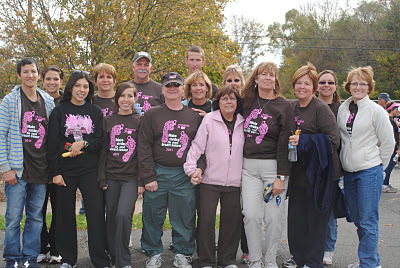 Sunday, I am walking in the Making Strides Against Breast Cancer walk. The picture above is of our team from last year. Doing this walk is very near and dear to my heart. Vickie of Vickie's Chickies fame is one of my very best friends in the whole world and she is fighting cancer for the second time in eight years. Vickie does this with the utmost grace and inspiration of anyone I know. If you didn't know she was sick, you would never guess it. She works a full time job as a first grade teacher. She is the caregiver to her father and mother-in-law. She is the first person to help anyone that needs it. She is my own personal Energizer Bunny. You never ever hear her ask "why me?" Vickie is a piece of my heart and I love her. I do this walk every year for her. If you could find it in your heart to donate to our team and help us meet our goal, I would be forever grateful. No amount is too small or too big. Please click on the link and donate. Thank you so much! !